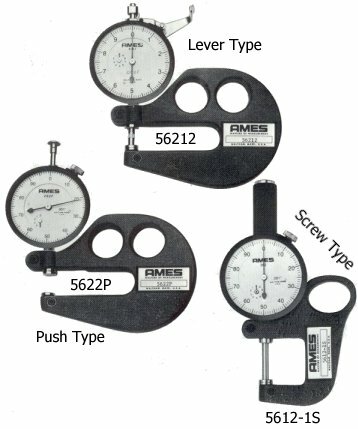 These hand-held dial micrometers are normally employed for such applications as sheet or strip thickness checking, small parts inspection, sampling operations, and other general purpose gaging where inreach requirements are up to 18". The accuracy and reliability, combined with the ease of operation, make units of this type an excellent choice for general inspection use. The wide selection of models available ensures an "in-stock" solution to meet thickness measurement problems. The readings are free from operator error. The deep-throat models are most often employed in measuring large unwieldy sheets or panels. The gage frames are durable and able to withstand rugged use. Their light weight ensures ready operator acceptance. 1. Rugged cast aluminum alloy frame. 2. Indicators with lift levers for opening normally closed contacts. Lifting lever retraction, even for the deepest throat models, assures ease of operation and constant, positive gaging pressure, free of operator influence. 3. 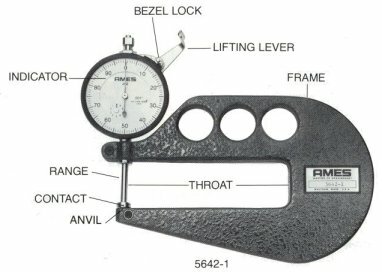 Clear easy-to-read dials insure quick, accurate measurements. 4. The indicator may be rotated slightly to position for best visibility and can be adjusted for contact wear. 5. Dials are fitted with Ames Rite Rev revolution counter as standard equipment. 6. 3/8" diameter flat contacts and anvils are standard. Options include conical, roller, chisel, carbide, button, ball or flats of needed diameter. 7. Can be supplied with Ames Jeweled Bearing indicators and tolerance hands. 8. Some models are available in special 2" ranges and metric. 9. Digital readouts are available for some models.